What Causes a Sudden Nosebleed? When an adult experiences a sudden nosebleed with no apparent cause, there could be many things that triggered it. While unexplained nosebleeds might seem serious, in most cases they aren’t. If it turns out that there’s a specific medical condition that triggered the nosebleed, your physician will advise you on what steps to take next. If you regularly experience unexplained nosebleeds, you should notify your doctor, so that they can give you an accurate diagnosis of the causes of your nosebleeds. 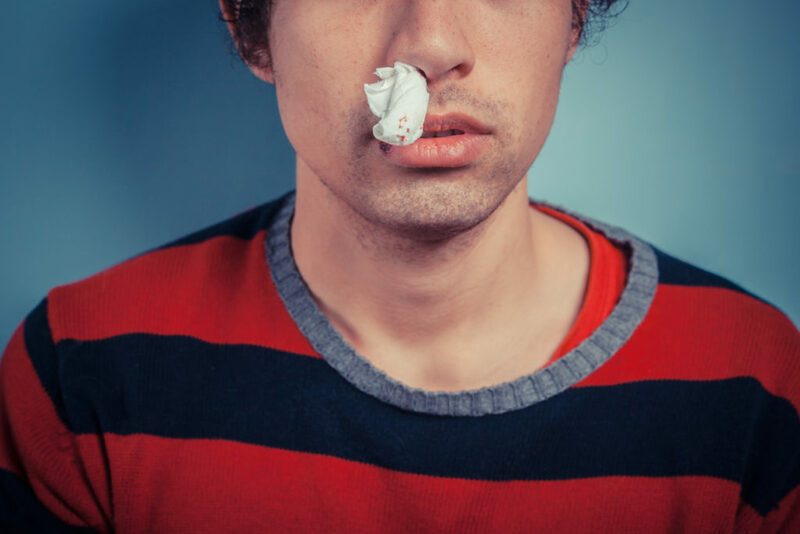 In this article, we will examine some of the most common causes of a sudden nosebleed, and how to treat and prevent this condition. Sometimes the cause of a sudden nosebleed can be something as simple as very dry air brought about by constant indoor heating. Dry air is a relatively common situation in cold weather when a heating system might be running for most of the day, with no humidifier at work to restore moisture. Nosebleeds can also occur when someone is exposed to cold weather for a prolonged period. Both these scenarios cause the lining of the nose to dry out, crack and bleed. To prevent the indoor heating cause, you can make sure your home is adequately humidified, especially during the cold season when the heat is on. For someone who has to spend long hours outdoors, the best preventive measure is to use a nasal spray which artificially moistens the inner lining of the nose. There are certain medical conditions which inhibit your body’s ability to form blood clots, and that can trigger nosebleeds at virtually any time. Kidney disease, liver disease, and persistent excess consumption of alcohol can all act to interfere with clotting and induce a sudden nosebleed. This condition can also be caused by congestive heart failure, high blood pressure and hypertensive crisis, which is a sudden blood pressure escalation coupled with anxiety, breathing difficulty, and an intense headache. There are also some very common medical conditions which can contribute to the triggering of nosebleeds, such as colds and allergies, as well as just blowing your nose frequently. All these can severely irritate the nasal lining, and trigger spontaneous nosebleeds. Do you take blood thinning (anticoagulant) medications? If so, they might be the culprit behind your sudden nosebleed. Many medications which are used to treat pain can have the side effect of triggering nosebleeds. Included in this category are aspirin, anticoagulant medications, and nonsteroidal anti-inflammatory drugs (NSAIDS). Blood thinners like these inhibit the body’s ability to generate clots, and that means they can not only cause a nosebleed but can make it much harder to stop one that has started. These kinds of medications are often prescribed for someone who has an irregular heartbeat, or someone who has had an actual heart attack. Since blood clots can cause a stroke or heart attack if they travel through the body and lodge near the brain or heart, people with heart conditions are often prescribed blood thinning medications which act to deter clotting. The cause for a nosebleed can sometimes be a little more obvious, such as the case for someone who is constantly picking or scratching. This kind of activity can easily injure blood vessels in the nostrils, causing nosebleeds that seem to come out of nowhere. This kind of nosebleed is most common with small children. Most nosebleeds can be stopped or treated at home, without the need to seek medical treatment. If home treatment methods fail to get it under control, you should find medical attention, even though such situations are rarely life-threatening. One technique for stopping a nosebleed is to sit down and lean forward, using direct pressure against the nostrils to pinch them closed for approximately 10 minutes. During that span, you’ll have to breathe through your mouth. It may also help to spray your nostrils with a nasal decongestant, because that constricts the blood vessels, and limits blood flow through the nose. Once you have stopped the nosebleed, you can prevent it from recurring by using topical ointments and saline inside the nostrils. And of course, you should avoid any further irritation of the nose from scratching or nose-picking. Especially for patients who take blood thinners, medical attention is their best option. These anticoagulants will decrease the body’s ability to clot and stop the nosebleed, and talking to your doctor will help them modify the dosage of any blood-thinning medication you might be taking or change it altogether. If you have more than one nosebleed in the same week, that’s a definite sign that you should talk to your doctor. In most cases, sudden unexplained nosebleeds are not serious medical conditions, but when they happen more frequently in a short timeframe, they can be warning signs of more concerning health conditions.